VMware Front Experience: How to update your standalone host to ESXi 5.5 - beware of missing drivers and do NOT upgrade virtual hardware! How to update your standalone host to ESXi 5.5 - beware of missing drivers and do NOT upgrade virtual hardware! After announcing it at VMworld 2013 in San Francisco VMware has released vSphere 5.5 (and other related product updates) yesterday - surprisingly on a Sunday, so the news is not yet out on *all* virtualization related blogs, but this will surely change during this day. Duncan Epping has posted a list of all download links on his blog. In this post I will provide a quick way to update your standalone ESXi host to ESXi 5.5 and an important heads-up for the early adopters. It might be very important to use update and not install here! More on this later. Reboot the host to complete the update. Find a Windows machine that is connected to the Internet and install PowerCLI on it. These commands will create the ESXi 5.5 Offline Bundle in the current directory. Upload the file to a datastore of your host using the Datastore browser of the vSphere Client. In this example we will use the datastore named ds1. Change that to match your own datastore's name! and reboot the host to complete the upgrade. Watch out! Some drivers for unsupported NICs are missing in ESXi 5.5! You attempted to install an image profile which would have resulted in the removal of VIBs ['VMware_bootbank_net-sky2_1.20-2vmw.510.0.0.799733', 'VMware_bootbank_net-r8168_8.013.00-3vmw.510.0.0.799733', 'VMware_bootbank_net-r8169_6.011.00-2vmw.510.0.0.799733', 'VMware_bootbank_net-s2io_2.1.4.13427-3vmw.510.0.0.799733']. If this is not what you intended, you may use the esxcli software profile update command to preserve the VIBs above. If this is what you intended, please use the --ok-to-remove option to explicitly allow the removal. ESXi 5.0 and 5.1 included drivers for network adapters that are not officially supported by VMware, but were very useful for installing ESXi on whitebox hardware, e.g. net-r8168 and net-r8169 for certain Realtek adapters and net-sky2 for Marvell adapters. If you do not use any of the above listed drivers then it is safe to use the install command and add the --ok-to-remove option like stated in the error message. If you do use any of these drivers then you must use the update command to preserve them. 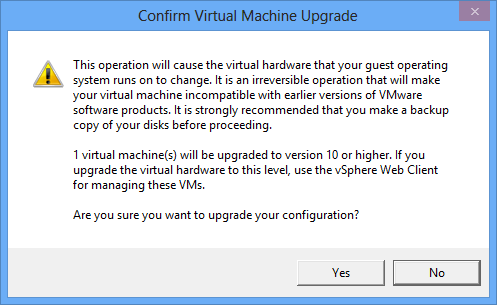 Do not upgrade the virtual hardware of your VMs! "If you upgrade the virtual hardware to this level, use the vSphere Web Client for managing these VMs." "Use the vSphere Web Client to edit the settings of this virtual machine"
On the one hand this is somewhat disappointing for users of standalone ESXi hosts, on the other hand in most cases you do not really need to upgrade the virtual hardware of your VMs ... unless you really need some of the new features of hardware version 10, e.g. the possibility to add a virtual SATA AHCI controller. Thanks a lot for the warning about the virtual hardware 10 issue. If you have a VMWare Workstation 10 license, it can be used to edit HW rev. 10 virtual machines on ESXi host. When the white-box drivers are no longer delivered with VMware 5.5, can they still be downloaded separately? Or are they not supported at all? Is there a way to create an install medium with 5.5 and the drivers included? These drivers have never been officially supported, but they work also with ESXi 5.5. If someone is aware of Marvell 88SE9172 chipset driver for ESXI. How do I manage rev 10 VMs on the free ESXi 5.5? I don't have vCenter, can't I access ESXi 5.5 with browser then (Web Client)? You can still manage them with the legacy client (e.g. power on/off, shutdown, console access), you just cannot edit the properties anymore ... The Web Client requires a vCenter server and does not work with a single ESXi host (currently). You can also use scripting (PoiwerCLI etc) to manage rev10 VMs, incl. editing, even with a standalone ESXi host. But Web Client access to standalone ESXi will probably be introduced soon? any infos about this? That is not sure, I do not have any information... Maybe there will be news on this at VMworld Barcelona. Anyone find anything about adding support back for the ASM1062 Serial ATA Controller? I looked through the list of packages on the repo server but i couldnt find anything. apologies, trying to run the offline scripts but for some reason the 2nd part of the script just hangs there,it doesn't seem to be doing anything is this normal? as i dont see a percentage for downloading or anything. Do you mean the PowerCLI Export-EsxImage Profile command? This can take a while to complete depending on your download link speed. The command will download about 300MB from the VMware Online depot and will not show any progress bar. So i'm still running VMware ESXi 5.1 and it didn't like the arguments you gave in the command for the power cli...do I need to upgrade to power cli 5.5 to make this work? No, I also used PowerCLI 5.1 and have not yet tested PowerCLI 5.5. It returns the command output as if used a bad argument or no argument. Beware of (no) line breaks in the code. There are only two lines of PowerCLI code. Also post the exact error message, please! What is worse is that the new features of ESXi 5.5 (such as > 2 TByte virtual disks) are supported only with virtual hardware version 10. But in order to manage VM with that version, you got to have a paid-for vCenter Server because vCenter Web Client relies on that. Thus, none of the new 5.5 features can be used for free. Virtual disks >2 TB can also be used with VM hardware version <10. If anyone is wondering you can also use vmware converter to convert vm hardware version 10 to earlier hardware versions. I have tested this a couple of times with a file server (with pci passthrough) and a 2008 DC and there where no adverse effects I could see. YMMV so use at your own risk! Just a FYI as this article was the first to come up in a search. So you can find out the exact profile name. for offline how do you get the .zip files as vmware downloads only have .iso file. You need to create the Offline bundle zip files on your own using PowerCLI. See instructions in my post starting at 2. You can also downgrade your VMs from hardware version 10 to 9 with a simple vmx file edit. You can see my blog article here for instructions. It works! Thanks Mike, best solution suggested thusfar. your answer is now here! How do we update to 5.5u1 from the command line on a stand alone host? Thanks for your blog. I am just learning VMware/ESXi and the information here is very helpful. I have a question regarding updates using your method. I am using DELL custom ISO images to update my ESXi hosts. I have done this successfully manually (CD boot). Can I use a method similar to what you did with the offline bundle and use these DELL images in a similar fashion? unfortunately you can not, because Dell supplies customized images only in ISO format, but not as an Offline bundle (like e.g. HP). So you are stuck with either booting with the Dell ISO. If you have vCenter with Update Manager (VUM) available then you can also import the Dell ISO file in VUM and create a baseline from it to patch your hosts. does this approach require physical access to server after reboot or 5.5 will just boot (without EULA etc)? Thank you. it will just boot like always. No physical intervention at the console is needed. Will the firewall rule (outgoing http) persist upon reboot ? yes, the change will persist a reboot, and yes, your command will revert it again. yes, this should work. The custom driver that you are using for the NIC should be preserved if you use the update method. If not then you can revert to the old ESXi installation by following the process described in http://kb.vmware.com/kb/1033604. Can I upgrade straight to 5.5U2 from ESXi build of 5.5.0 - 1331820. I am having trouble with adding a NFS and APDs being reported in the event log. For what I have read some people suggest upgrading to 5.5U2 to clean up this bug? ye,s you can update straight to U2. But the NFS bug was introduced with Update 1 (Build 1623387), and you seem to be on GA if it's really build #1331820.